We strive to eliminate microviolence from everyday lives of individuals with Mental Health / Intellectual Developmental Disabilities to effectively get their needs met. 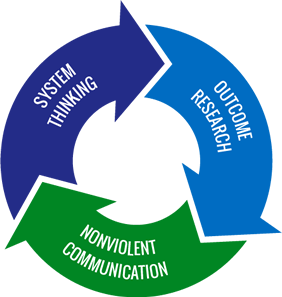 Our services integrate best clinical practices, outcome research findings, system thinking and the nonviolent communication framework. We offer a variety of individualized technical assistance and onsite consultations focused on helping organizations learn how to be Person Driven. We can help your organization and people learn how to connect with others and implement being Person Driven. Person Driven Clinical Solutions, LLC (PDCS) is a qualified provider of supports and Behavioral Support Services to individuals with Mental Health / Intellectual Developmental Disabilities. PDCS, LLC also offers individualized technical assistance; on-site consultations and trainings to a variety of organizations across the United States interested in becoming truly Person Driven. It is primarily under contract with human service organizations participating in the public social service systems of the Commonwealth of Pennsylvania. Being Person Driven integrates Positive Approaches, System Thinking and the contributions of two very influential groups: The important work of the Heart and Soul of Change Project www.heartandsoulofchange.com summarizing what we are learning from years of outcome research as well as the simplicity and wisdom of the Nonviolent Communication model developed by Marshall Rosenberg www.cnvc.org. It is representative of the necessity for providers to rebalance the traditional power structure within programs, supports and services. Being Person Driven is a very simple and powerful way to connect with others yet, not habitual for most people. It is designed to help anyone appreciate how we often unintentionally create conditions while helping where the people we are trying to support experience oppression, humiliation, and dehumanization.